1. she writes you letters in icelandic (you don't speak icelandic). 2. one time she showed up at your front door dressed in a polar bear rug and asked if you wanted to go "sweeping." you didn't know what she meant, but said yes anyway, and you went and you still don't know what she meant. 3. she periodically sends you crates with instructions to NEVER open them. there are things inside that make noises. you have 17 in your basement. 4. you've met all her aunts, uncles, nieces, nephews, and cousins, but have never seen her children. 5. her voicemail greeting is something about being in an "ocean heart" -- you've listened to it a hundred times and still can't make it out. 6. you've only ever seen her eat mushrooms she grows in the forest behind her house, and you've never seen mushrooms like this anywhere else. they're translucent and have tiny little faces. 7. at sporting events, she stands and screams when everyone else is quiet and vice versa. you smuggle in a thermos of hot tea with honey for her throat. 8. you once took her shopping for her birthday and she just cried silently the whole time. Everyone knows about Henry VIII. There are even chapters in textbooks about Henries I - VII. But very few people have heard about Henry IX. "But I thought Henry VIII didn't have any legitimate sons!" You're right. But he did have a wily, rascally cat! 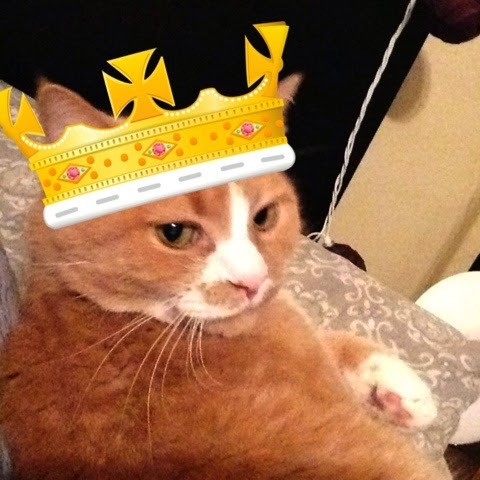 Introducing: Henry IX, the cat with IX lives and just as many wives! Henry IX tricks Cardinal Woolsey (a cardinal) into being his friend, then eats him! Henry IX gets locked out of his castle overnight and sires 900 kittens — all female! Henry IX orders the beheading of his wife, CATherine. Critics call Henry IX "a show that practically writes itself" and "full of cats." We tried to get one of them to say "meow-velous!" but they refused. Catch Henry IX Thursdays at 9/8 central, right after The Dogtors.